Kraftmaid Cabinet Reviews - Largest Semi-Custom Cabinet Manufacturer! / Kraftmaid Cabinet Reviews – Largest Semi-Custom Cabinet Manufacturer! Kraftmaid Cabinet Reviews – Largest Semi-Custom Cabinet Manufacturer! 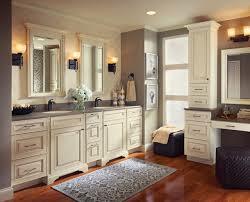 Kraftmaid is one of the leading manufacturers of kitchen and bathroom cabinets in the U.S. If you’ve purchased some new storage in the last 20 years you’ll almost certainly have seen some of their products on display but here’s some more information about the company and what they do. Hopefully after reading our guide and Kraftmaid Cabinet Reviews you will realize just how great this company is. Kraftmaid truly came from humble beginnings, beginning in 1969 in Ohio with a single man store. By 1981 they had begun expanding and by 1990 their revenue was over $100 million. Since then they’ve been continuing to grow and their goods can be found in more and more homes. To accommodate this growth they have expanded across state lines with a $25 million development into Utah. Over 40 years in the industry have allowed them to become the largest manufacturers of semi custom cabinets in the U.S. Their innovative products and solutions have allowed them to diversify outside of bathrooms and kitchens and provide storage solutions throughout the home. Kraftmaid believe in quality, simplicity and price. They have the widest selection of choice for customisation with over 100 different cabinet door designs alone. They believe in giving the customer a range of options to make the cabinets their own but without the usual price tag that comes with it. This is why they have developed their semi custom option for their products which give the customer a great mix of style, selection and affordability. Kraftmaid have a real passion for efficiency, consistency and quality. They ensure all of their products live up to these standards by having all their manufacturing operations within the United States. Within the primary manufacturing centre in Ohio, all of the elements of the cabinets come together where they are built, packaged and shipped in one production line. Kraftmaid have a well organised system that allows them to pass on savings both in time and money for the customer. Kraftmaid produce cabinets and storage solutions for the whole home. 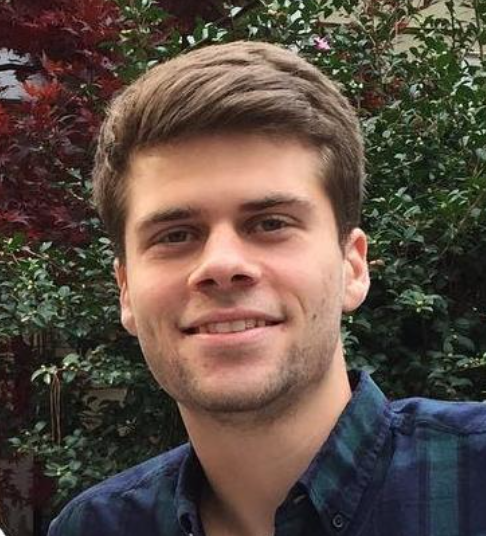 They are always looking to improve their work and have pioneered new products specifically to benefit disabled customers with innovative designs. Kraftmaid excels in it’s kitchen cabinet creation and throughout it’s history has been developing different products to fit the customer’s specific needs. There are three main cabinet choices: Custom or store built cabinetry, Semi custom cabinetry and stock cabinetry. With the main choices being wall units, base units and tall units. Owners of Kraftmaid semi custom cabinets seem pleased with their purchases. Most found them to be what they expected with a few reports of minor issues of scratches which were easily solved. Customers seem impressed with the durability of their kitchen cabinets which are standing up to daily wear and tear and survived in a busy home. A few people have taken issue with some Kraftmaid products, especially the custom cabinets. There are accounts of custom cabinets not coming out as expected, whether this is due to lack of design details or problems on the production end it is slightly concerning. It seems that Kraftmaid have made some mistakes lately and this can be attributed to their wide choice. By offering so many products their production line has to be very versatile and this variety comes at a price to some of their lines; inaccuracies with the finished product. Kraftmaid always looks to improve upon and are change things up frequently. This can mean that certain items are replaced and no longer stocked, making replacement difficult. All of this Combined with difficult customer service issues that occur in this industry when people are buying through dealers and not sure who to contact, has lead to some negative feedback. However, these are in the minority and there are more positive reviews than negative and mostly focused towards the completely custom units. Kraftmaid offer some of the most extensive selections of size and options available in the cabinet industry today. The custom built cabinetry is available to your exact specifications and the others are available in a range of sizes. The choices you make will be determined on the space you have available and ceiling height. GoodLifeKitchens has a great guide on purchasing cabinets based on sizes. Wall cabinet widths range from 9″ to 48″, increasing in 3″ increments. The shelving on the Kraftmaid wall units is adjustable for flexible kitchen storage. 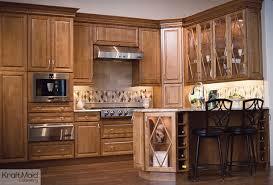 Tall cabinets are 84″, 90″ or 96″ high, range from 9″ to 36″ wide, are 12″ to 24″ deep. They’re available with doors or a door and drawer combination. The base cabinets and tall cabinets come with a toe kick area to make working close to work tops more comfortable. For more information about sizing be sure to ask your dealer, Kraftmaid can also arrange a professional to measure your space. ​Kraftmaid’s manufacturing process is always evolving with unique ideas being used to improve their workflow. Their finishing process is rigorous and from wood sealing to hand sanding they make sure the cabinets are sent off in the best condition. The finishing touch is their unique DuraKraft topcoat which provides a custom, oven-baked finish that extends the original color and clarity of the wood. This also helps the durability of the cabinets, allowing them more resistance against daily wear and tear. Kraftmaid offers a lifetime warranty on their products which is fairly extensive. The only real exceptions are for natural aging or wear and tear. This can give you some peace of mind that your cabinet is a long term investment for the home. Along with this, dealing with Kraftmaid customer support has been a breeze and I've only had to deal with them once our twice but both times they were extremely helpful and my problems were solved! Kraftmaid have a lot of different products and there are a lot of varying reviews to match. On the whole people find the company of great value, offering choice and customisation without the bespoke price tag from other companies. Overall you can't go wrong with Kraftmaid cabinets pricing, because for the the price you are paying you are getting customization and a style that looks amazing! 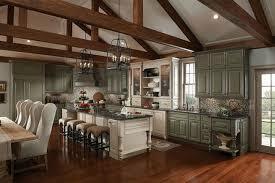 If you want other brands for custom cabinets take a look at Merillat and Timberlake reviews. Criticisms have been made of their custom units, with people knocking the comparable quality of other custom cabinet makers. Kraftmaid is a mid price range cabinet maker, charging less for their service than the other bespoke cabinet makers and unsurprisingly offering less. 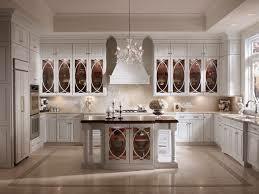 Their focus is on providing a cost effective custom cabinet service rather than expensive high end manufacturing. 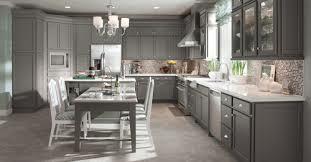 Check out Hampton Bay for quality cabinets at a similar price. You will get a value from Kraftmaid, as far as the quality I would say that Kraftmaid is more of a value with stylish design options and a mid-level cabinet manufacturer. Kraftmaid specialises in semi custom units which are a great way to get cabinets that are totally your own but at a competitive price. There is a reason they’re leading the industry in this field and the huge variety of customisation makes them an obvious choice. Unless you have something so specific in mind for finish, door style or construction Kraftmaid is by far more than enough and I would certainly not hesitate to put it in my house. Kraftmaid cabinets have a lot of options so you can spend as much or as little as you choose, depending on your customisation. Overall, I hope you have enjoyed our Kraftmaid Cabinet Reviews and you give this company a chance in your kitchen, as you will surely enjoy it!